Some homeowners think that, because they have water that comes from a treated public supply, there is no further action that they must take to have clean water. This is not really the case, though. Sure, homeowners using well water on their property must be very vigilant in treating that water as needed to ensure that it is safe. However, even the water that is treated at a municipal plant and then sent off to homes connected to the city’s plumbing system can be compromised. So how are you to know if you require a residential water treatment system? Professional water testing is really the only way to determine with certainty what, if any, action must be taken. Before you can even schedule water testing, though, you need to realize that there is possibly something wrong with your water quality. Call our number if you notice any of these symptoms in your home. Maybe the most obvious sign of trouble with your water is water that is not clear. If you pull a glass of water from the tap and it looks cloudy (this is known as turbidity), remember that this could just be the result of oxygenation. If the water does not settle to a clear state, though, or if you can see materials floating around in that water, then you probably have an issue that a water filtration system or reverse osmosis system could resolve for you. While point-of-use water filters or filtering jugs have their uses, a whole-house filtration system really is your best bet for the effective and convenient cleaning of your water. Even more alarming than a cloudy appearance to the water coming from your taps is a foul odor coming from the water. You may notice an earthy smell coming from the water, which could be the result of organic materials in any surface water supply. 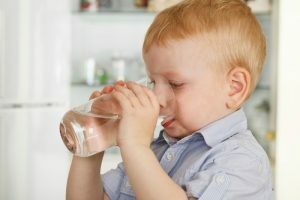 Certain naturally occurring metals, such as Barium, can give water a fishy odor, and Cadmium can make its way into a water supply through fertilizer contamination or even the deterioration of galvanized pipes. Again, carbon filtration or reverse osmosis systems can resolve these problems. You could even notice the smell of chlorine coming from the water, which is used to boost water quality to begin with! Even if you don’t keep the tidiest house in the neighborhood, you probably cannot stand to see the buildup of ugly white and green deposits on your plumbing fixtures. Simply scrubbing these deposits away over and over again is really not the best way to resolve the problem. Instead, you should get rid of the cause of the problem: hard water. Hard water is water with too high a concentration of minerals, typically calcium and magnesium. By using a whole-house water softener, you can reduce the occurrence of these buildups, and enjoy cleaner looking clothes and better feeling skin. If you think that you need a water treatment system in Tampa, FL, schedule service with Experts Plumbing Services, LLC.